The Israelites were very good at celebrating. They partied when they wanted to remember things, they partied when they wanted to forget other things and every accomplishment was worthy of a celebration. 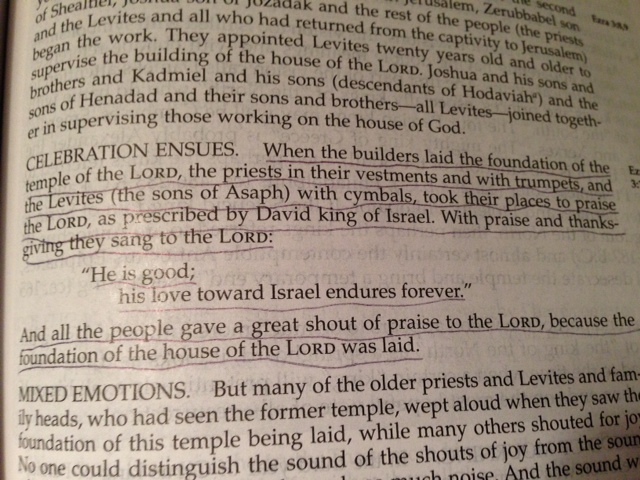 In Ezra 3, we read of them getting out their trumpets and shouting their praise to the Lord as they finished the foundation of the new Temple of God. Sunday morning worship often feels like a celebration to me. It sometimes can feel like quite a big accomplishment to get through another week of pushing back against the darkness and lies of our culture. Spending time with my church family reminds me that there are other people who also love God and other people on this journey of faith with me. I’m not alone. Living a life faithful to God yet in the trenches of our society can feel like a never-ending battle. What a privilege it is for us, as believers of God, to gather together. We get out our trumpets, guitars and pianos so we can sing and shout praises to our God. We celebrate the fact that God has already won the war! And he will give us victory each day as we ask, listen and obey.